Many times, especially when you are doing dynamic layouts, dealing with bindings and DataTemplates – you start scratching your head trying to figure out why your control is not showing up where you want it to show, how to fix it or simply what are the coordinates of some point. You can look through your code, but sometimes the problem is not in your code or it just is not clear. In such situations it often helps to debug the visual tree of the application and you can do it by browsing the object tree in Visual Studio, but it is sometimes quite laborious since you would usually have to call VisualTreeHelper.GetParent many times before you get to where the problem lies – if you do not get confused on the way and give up. In WPF – I used to use Snoop or Mole. In Silverlight – I did not hear of such tool (I just found about Silverlight Spy today – but it is not free if you want to do anything with Windows Phone). To help solve it I used to write or copy&paste a small attached dependency property that makes the VisualTreeHelper.GetParent calls for me and outputs the interesting properties when a control gets loaded. Today I finally decided to clean it up a bit, make it better and share it with you, so here it is. This is just a Windows Phone (Mango) panorama project straight from the template with my VisualTreeDebugger class added and two breakpoint properties defined on some TextBlocks. One will break each time the DataTemplate that includes the TextBlock is applied and the TextBlock loaded, the other one – when you tap on one of the TextBlocks. Simply add the VisualTreeDebugger class to your own project, spacify the xmlns reference in XAML and either set VisualTreeDebugger.BreakOnLoaded="True" on your control to have the debugger break when the control first loads or VisualTreeDebugger.BreakOnTap="True" to break when you tap that control. 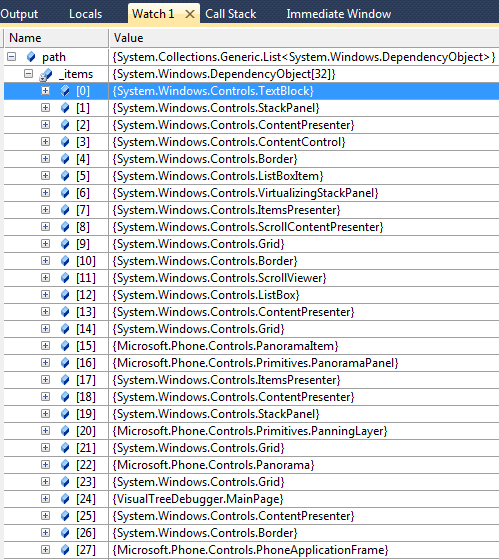 Then just run it from your Visual Studio with debugger attached (F5). You get a “path” field which is a list of all dependency objects between your debugged element and the visual tree root. It makes it easy to quickly get access to any of those objects to inspect their properties, when you debug it. In the Output/Debug (Ctrl+W, O) window for each of these elements – you get a trace of selected layout properties that may affect the layout, including type, name, actual dimensions and position, logical properties like Width, Height, alignments, Margin and Padding, DataContext and brush information to sweeten the deal. You can find that control somewhere in the dozens of elements of your visual tree that has the alignment or margins set incorrectly or screen position of some invisible panel, find the actual dimensions of the element you need to fill with an image, see which element sets the background for all its contents or simply learn about the structure of the UI. It is easy to use and modify. Why should I care about this project? On Windows Phone – rather than coding it yourself – the only other option for debugging visual trees I found was to pay for Silverlight Spy. 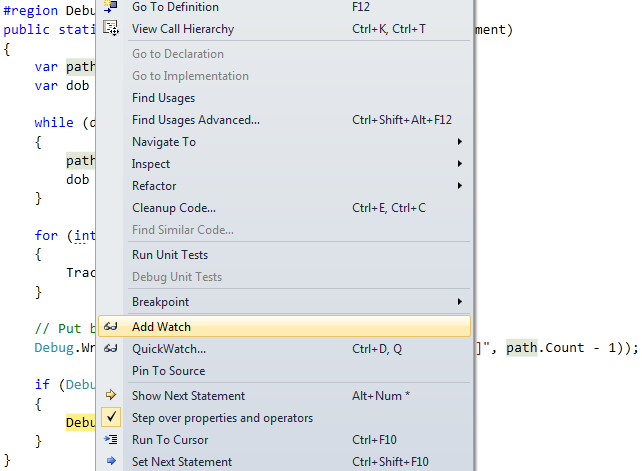 With the source code – you can easily add more details that you think might be missing or simply browse the Visual Studio “Watch” window to find them. /// it was applied to up to the visual tree root. /// Set BreakOnLoaded if you want to put the breakpoint yourself. /// up to the debugged control. /// helpful in debugging layout issues. /// indicates whether the debugger should BreakOnLoaded when control is loaded. /// Handles changes to the BreakOnLoaded property. /// the FrameworkElement on which this property is set is tapped. /// Handles changes to the BreakOnTap property. /// Occurs when the control this behavior is BreakOnLoaded to gets loaded. /// Put a breakpoint in here and set ControlDebugOnLoaded.BreakOnLoaded="True"
/// on any control to debug its visual tree. For now – this will have to be it. I am sharing my library and test projects here. /// indicates the binding path for the PanoramaItem.Orientation binding. /// Handles changes to the PanoramaItemOrientation property. /// indicates the binding path for the PanoramaItem.Header binding. /// Handles changes to the PanoramaItemHeader property. The funny thing about MVVM is that you might get so hooked on it that when you find something that just does not work with MVVM – you start trying to figure out how to bend it to the right path. One of such things is the ApplicationBar on Windows Phone.